California Family Law Report™ Monthly Magazine showcases the latest family law developments. 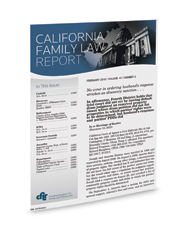 It includes comprehensive coverage of California family law cases, influential federal family law cases, plus other cases that are relevant to the practice of family law. Commentary and practice pointers are provided for many of the cases. A subscription includes a special year-end legislative issue that provides an annual roundup of all California and federal family law legislation and rules.